You’ve heard a million times that it’s important to visit your dentist, but have you ever wondered why? Have you also pondered about how often you need to see him? If so, your dentist of Park Slope has answers for you. As you continue reading, you’ll learn about how preventive dentistry serves as one of the pillars of your oral health. You’ll also discover how you and your local oral expert can work together to protect your mouth, teeth and gums for years to come. Your visits to your dentist for checkups and cleanings constitute the type of care that falls under the category of preventive dentistry. It involves you taking a proactive approach by working to create and maintain a healthy environment inside your oral cavity instead of reacting to problems. Needless to say, it’s much easier to prevent issues than it is to respond to them after they have run amuck. X-rays – There will be X-rays taken of your entire oral structure so that any problems that can’t be detected with the human eye can be spotted. Thorough Cleaning – A dental hygienist will thoroughly clean your teeth to remove any buildup of plaque and tartar. Dual Examinations – After cleaning your teeth, the hygienist will inspect your mouth, teeth and gums for any swelling, puffiness, signs of gum disease or other impending issues. Then your dentist will perform an examination of your face, jaw and neck to make sure that there are no signs of oral cancer, issues with alignment or other warning signs that need to be addressed. You should visit your dentist at least two times a year for preventive care, which serves as one of the pillars of your successful oral health. If you are a parent with children, it’s a good idea to schedule your appointments during their summer break and then at the end of the year, around the holidays. This provides a convenient way to ensure that the entire family is cared for. The semi-annual dentist appointment is one of the pillars of your oral health, but the other is your daily oral hygiene. This involves you brushing and flossing your teeth at least twice a day to remove harmful bacteria and leftover food particles that can lead to gum disease if not addressed. So by you doing your part for the other 363 days of the year, when you visit your dentist, you can feel confident that you will be actually gaining ground instead of constantly trying to correct problems. To schedule your first appointment with your Park Slope dentist, feel free to reach out to him and prepare to enjoy the full benefits of having excellent oral health! Dr. Frank J. Sapienza received his undergraduate degree from New York University and then went on to earn his Doctor of Dental Surgery degree from the New York University College of Dentistry. An author, educator and provider of care, Dr. Sapienza is also a member of the American Dental Association. 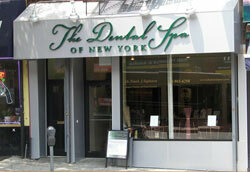 He practices at The Dental Spa of New York and can be reached for more information through his website.